K-pop duo MXM members released a video clip, sharing their impressions on V Live after coming back from their first US tour on Thursday night. “We came back from the American Tour. We met various fans, and experienced all different stages and environments. We were able to learn a lot and most of all, I feel confident about English,” said Dong-hyun, adding that he wanted to study English more. Im Young-min also said he felt like a true American when he was communicating with local staff during the tour. Kim teased Im about the Korean accent he has when speaking English. During the broadcast, fans asked what food they missed the most. Kim and Im shouted out agwi-jjim(braised spicy monkfish) and maeun-tang (spicy fish stew) with sujebi (dough flakes). They ended the V Live, saying they were off to have agwi-jjim for their dinner. 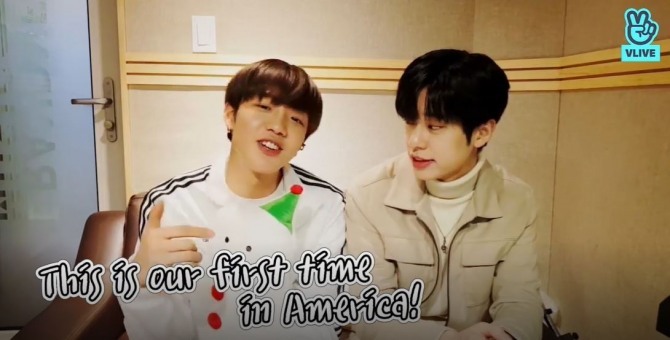 K-pop boy band successfully held their first US concert tour “MXM 1st Meet & Live US Tour” in six cities including Minneapolis to San Jose from Jan. 18 to 26.